This story originally ran on Aug. 3, 2018. We are re-airing it as one of our favorite music stories of the year. More than 1,100 miles separate Downey, California and Lubbock, Texas. 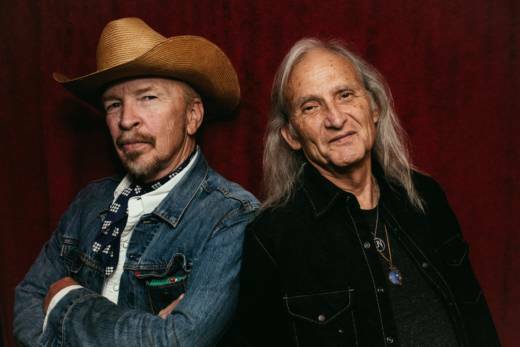 But for songwriters Dave Alvin and Jimmie Dale Gilmore, their hometowns have a lot in common -- culturally and geographically. “They’re both flat,” Alvin says. “With big sky,” adds Gilmore. Alvin, the baritone-voiced guitar slinger, was part of the early L.A. punk scene with the Blasters, the band he formed with his older brother Phil. He's got more than a dozen albums of his own. Gilmore has garnered three Grammy nominations in folk categories, and is a founder of country pioneers The Flatlanders (with Joe Ely and Butch Hancock). 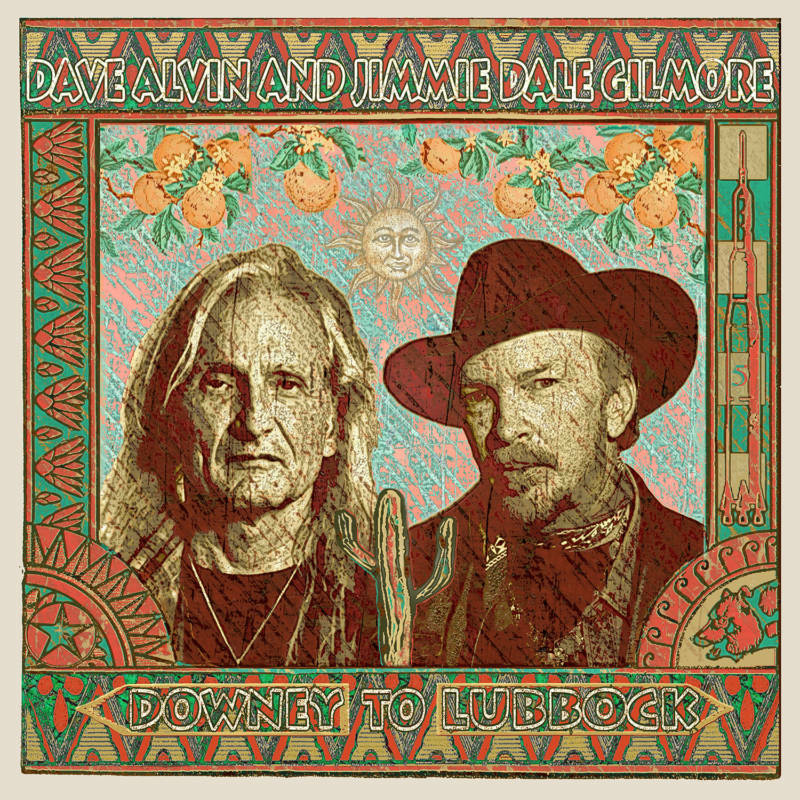 The longtime friends have teamed up on "Downey to Lubbock," a collaborative album featuring a mix of original songs and covers. The California Report Magazine's host Sasha Khokha talked to Alvin and Gilmore about their new record, working together and growing up around the legendary Southern California club, the Ash Grove. SASHA KHOKHA: You guys aren't the most obvious pairing. We’ve got California meets Texas, two musicians from two different generations and different musical traditions. JIMMIE DALE GILMORE: We’ve been very good friends for a very, very long time, but we never played music together until last year. So looking back, it’s kind of odd to me that we never thought of it before. DAVE ALVIN: People say, “What an odd pairing!” Not to us, it’s completely natural. I mean an odd pairing would have been maybe me, Jimmie Dale and Bjork. Even that could have worked! KHOKHA: So you guys have been touring this summer with your new album "Downey To Lubbock." How did the idea of doing an album together happen? GILMORE: And during these gigs, just right away we discovered we had a whole trove of shared musical background -- stuff that we both loved when we were young and learning how to play. Because we were playing acoustic, it brought up the old folk singer and folk blues side of what I had done early on that I hadn't really touched in a really long time. KHOKHA: Tell me about the title song, "Downey To Lubbock." It's basically your origin stories: Blues blaster meets old flatlander. ALVIN: It's semi-autobiographical and metaphorical and you can dance to it. I had the idea that we should have a defining song for the record. KHOKHA: It’s like the story of your two road trips through life converging on one highway. ALVIN: Downey, California and Lubbock, Texas are not that different in some ways. I remember the first time I was ever in Lubbock was around 1982, and just being struck by how similar they looked to each other and culturally, there are a lot of similarities. My hometown was in the southeast corner of Los Angeles County, which was the land of the diasporas. You had people from Texas and Louisiana, African-American and white and Hispanic. And so for me it was really easy when I was a kid to find the music that interested me because everybody that came to California brought their music with them, whether it was blues or country or whatever. So those areas were always sort of mythical promised lands to me. GILMORE: Neither one of us had realized that I had been in California when I was probably 19 or 20 and I spent some time in L.A. I used to go to the Ash Grove. It turned out that Dave and [his brother] Phil were hanging out there at the same time. They were quite a bit younger than me but we were listening to the very same music and we had that in common to draw on. ALVIN: I was 10 years younger and I came up to Jimmie’s hip. Who knew that we crossed paths at the Ash Grove and then 40 years later we'd make an album together? KHOKHA: How did you guys decide what songs you wanted to cover? ALVIN: We would start each show with a song that the audience knew and we'd end the show on a song that the audience knew. But in between were just flights of fancy. And so our shows would cover everything from Lightnin’ Hopkins to Merle Haggard to Sam Cooke. And so each night was different. And so it’s sort of culled from that touring experience but it's also songs that struck some kind of emotional chord with us. KHOKHA: You do the Woody Guthrie song "Deportee" about that plane wreck in Los Gatos Canyon near Fresno [that killed 28 Mexican workers in the process of being deported]. It's like a piece of history that so many Californians have forgotten. What inspired you to revive it now? GILMORE: "Deportee" is a beautiful piece of work. It’s so poignant and so well done. Dave has been saying that it's one of these songs that is unfortunately, both timeless and timely. ALVIN: I'm really proud of that one the way it came out. The night before we recorded I stayed up late listening to about 125 versions of "Deportee" because I was like, “OK we have to make it different from all of these.” And then once Jimmie Dale started singing it, I was like, “Wow, I didn't need to stay up all night listening to eight million versions of 'Deportee. '” Jimmie's got the kind of voice that says, “Here here's a new song,” even if it's 60 years old. KHOKHA: You guys are both solo artists. What was the most surprising thing about working and collaborating with each other? Was there anything unexpected? GILMORE: All of it, in a way, for me. We were fans of each other, but we hadn't actually played together, so discovering how much we had in common in our backgrounds was a giant surprise to me. I've been sort of typecast in one world as a country folk-y. I don't know what the word is. GILMORE: And Dave is so associated with punk with the Blasters and both of us have a lot more wide-ranging taste than people would expect of us. ALVIN: It's just been an absolute joy. There are no problems, there are no issues and we tend to see everything the same which makes life easy. GILMORE: Dave is not only a very great guitarist and singer although he denies it; he's a very good singer. But he's also strangely enough, a very good organizer and he’s a good boss. ALVIN: When I was in the Blasters, we all grew up together. We liked to fight, that was our deal. And then one day I got sick of it and decided I'm going to work with people who I don't fight with. So that's my organizing principle.